A low budget classic, Enter The Dragon was Bruce Lee's final complete movie before his untimely death, and a milestone in Hollywood's brief flirtation with martial arts action thrillers. Enter The Dragon cost $850,000 and is estimated to have earned more than $90 Million world-wide. 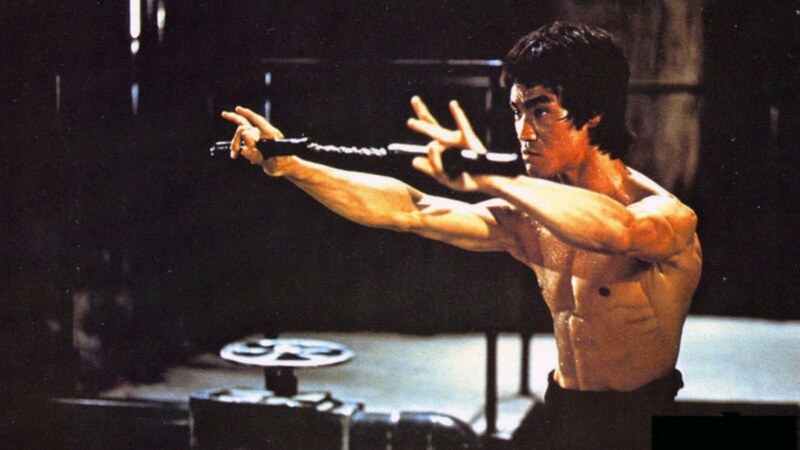 Lee's death would put an untimely end to any mainstreaming of a martial arts movie star until the arrival of Jackie Chan (who briefly appears in Enter The Dragon) half a generation later. Lee (Bruce Lee) is an exceptional martial arts student at the Shaolin temple. He is selected by mysterious Hong Kong government-types to infiltrate the island base of the evil Han (Shih Kien), a former Shaolin student who has sullied the name of the temple by turning to crime: he specializes in drugs, human trafficking and prostitution. Lee is given an added incentive to seek personal revenge: in flashback it is revealed that Han and his bodyguard O'Hara (Robert Wall) were responsible for the death of Lee's sister. Lee travels to the island pretending to be a contestant in a martial arts competition hosted by Han, and along the way he meets fellow contestants Roper (John Saxon), a gambler in trouble with loan sharks, and Williams (Jim Kelly), who is on the run from the cops. After the three are offered their choice of female companionship, Lee kills O'Hara and starts snooping around the island, Williams is killed by Han, and Roper kills Han's most fearsome fighter, Bolo. When the prisoners on the island are released and take on Han's numerous henchmen, the hordes of chaos are unleashed and it's everyone against everyone. It is left up to Lee to chase down Han and force a final, memorable confrontation to the death. Influential and frequently imitated in the same vein as A Fistful Of Dollars, Enter The Dragon made Bruce Lee an international star, despite his mysterious death. He dominates the film with a brooding, wiry physique made of highly-strung and finely toned muscles. Lee choreographed the fight sequences, and they are the undoubted highlights of the film, ballet with undisguised brutal power. The rest of the performances by a cast aspiring to Grade B status, and the pedestrian directing by Robert Clouse, are fully consistent with a low budget action movie hoping for nothing better than left-over James Bond fans. Instead, the likes of John Saxon and Jim Kelly gained screen immortality by playing their role in an accidental, and ridiculously enjoyable, classic.